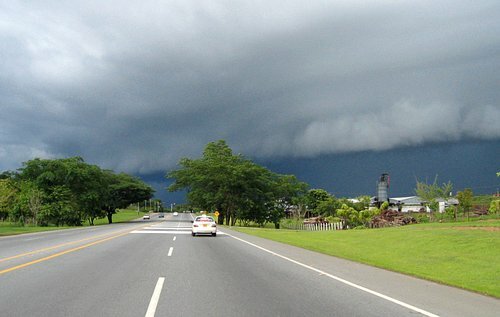 Just some random pictures I took while rolling down the roads in various places. The Rio Boconó. You cross this just as you leave Boconó and head up into the mountains. It was rainy, foggy and cool, but it was still nice to be there. 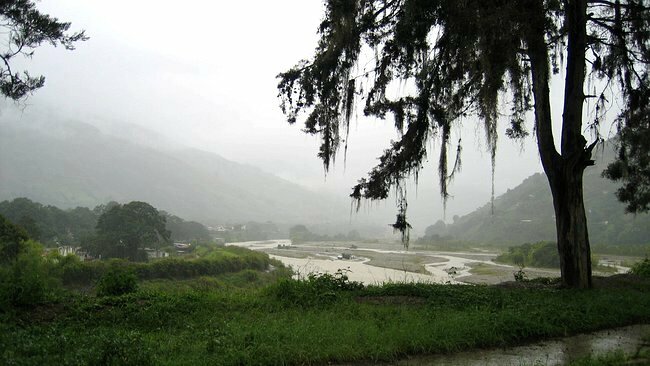 This is Campo Elias which was about 10 kilometers northwest of Biscucuy. Just your typical village. We followed the bus in front of us for a good way around all of the curves. The driver really knew how to drive that thing. 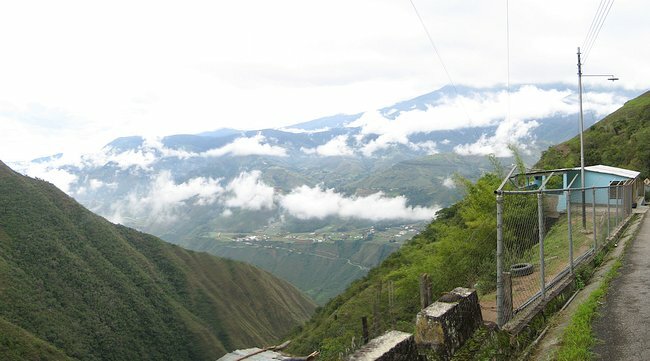 Below is a picture looking down into the Rio Motatan valley from near the town of La Puerta. La Puerta ("The Door") refers to the place where a roadway was established through the mountains behind me through to the Pacific coastal sections of the country. 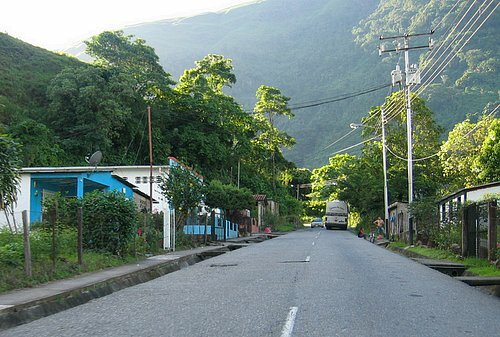 The buildings in the valley are the town of Montero or Jajo. The house on the right was right on the edge. The sky was not kidding. 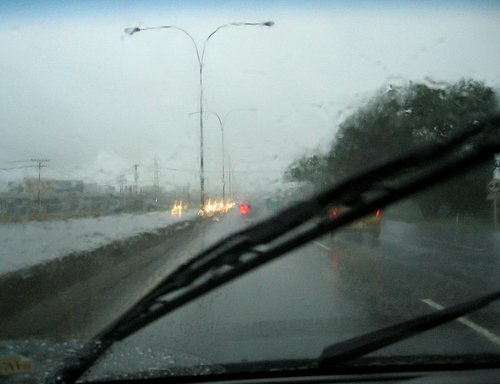 It rained a lot for 20 or 25 kilometers. The air was nice and fresh afterwards. 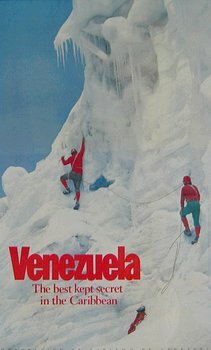 This was a poster in the teleférico station La Aguada in Mérida. I didn't get to see this part of Venezuela. Where IS that part of Venezuela?? Nice art. I don't know what that monstrosity in the middle of the picture was though. 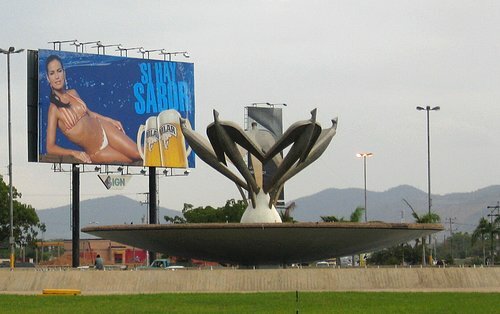 This was at a roundabout near the Barcelona airport. Viva la Polar!! 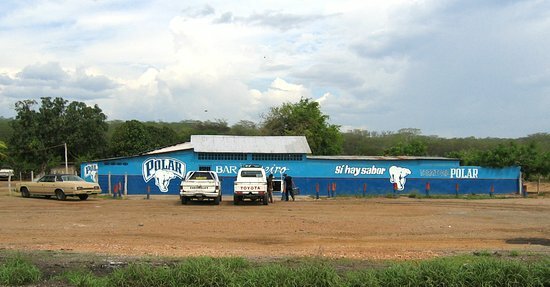 This bar was near Clarines, Anzoátegui. I didn't get to stop. Actually, the Polar beer universe had undergone a change since I was in Venezuela in 2001. Nearly everywhere we went on this trip the only Polar beer that you could get was "Polar Ice". I think it was a diet version. It was not very good. When you go you need to find places that still sell Polar "normal", and make sure it is ice cold. A lot of towns had statuesque art work in the medians and roundabouts. 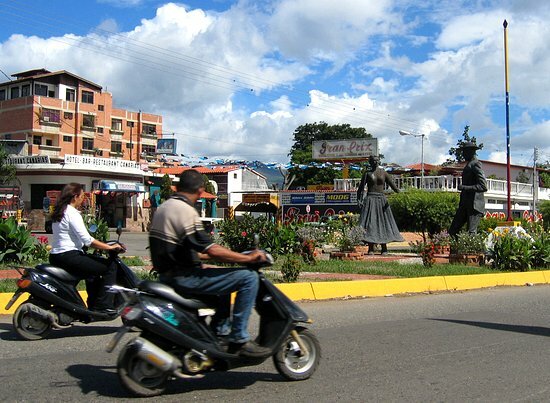 The statues below were in the city of El Tocuyo, Lara. Nice. 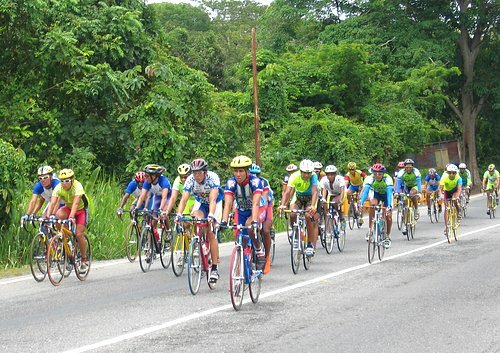 A bicycle race that we stopped for along the highway when we were moving from La Victoria to San Agustin.